Jumpshare is an easy to use storage, sharing and viewing web application that distinguishes itself from its competition (Google Drive, CloudApp, Dropbox, Skydrive, and others) by offering to its user ability to not only store and share files between each other, but also to directly from their browser preview more than 150+ file types! And not only that, you can do that and much more without even going through registration process. Clearly designed to be more just than simple file sharing app, Jumpshare offers to its users variety of useful features that make the pains of file sharing go away. You can drag and drop files from your computer to Jumpshare browser window to start uploading, immediately take link of your file and start share it on social networks even if the file upload is not completed. Without paying anything you can share up to 2 GB of files with 100MB size limit for each file and servers will host your data for two weeks before deleting them. Amazing online storage for FREE! The arena of file sharing and content management web applications is so large, that it is sometimes difficult to truly see the scope of it and to find a product that is truly compatible with your needs and wishes. One of contenders to the throne of your favorite file sharing service is Jumpshare, which manages to turn your browser into powerful file viewer with the ability to directly open in your browser window over 200 file types. This industry leading statistic enabled Jumpshare to quickly gain popularity, enabling both novices who are interested just to see content fast without hassle and professionals who are working on a large scale project to save their time by eliminating need to find some standalone file viewers which often support some but not all file formats that they need. Launched only in 2012 under the leadership of GhausIftikhar who has previously founded popular website AddictiveTips, Jumpshare was bulit from the ground up to solve the problems of inefficient file sharing, bad design and in-browser ability to view contents of files without having to download them or use any 3rd party viewer. 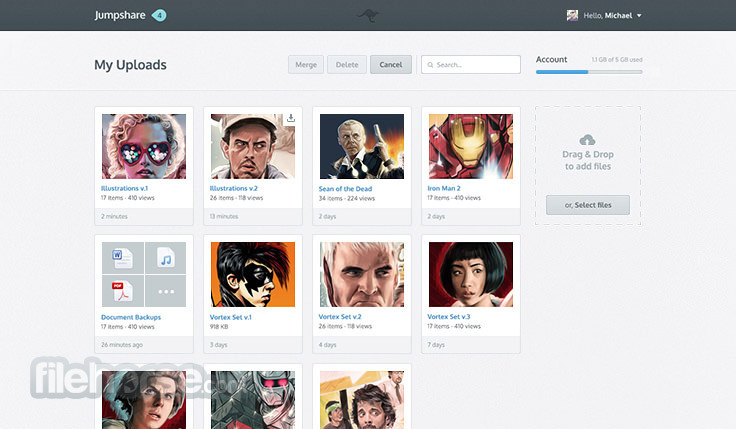 With goal to serve as wide user base as possible, Jumpshare enables you and people that are interested in design, photography, engineering, music, singing, and countless others to upload, manage, share and immediately view contents of those files, all from your internet browser window. No matter what documents and files you are handling (books, images, music, videos, articles, design mockups, spreadsheets, fonts, code files, fonts, etc…), Jumpshare and its powerful cloud-base tools will be able to decode them in seconds and show them to you. 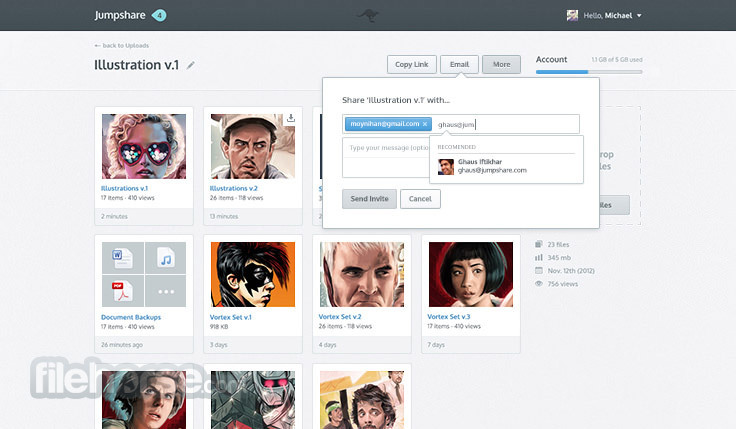 Another crucial feature that made Jumpshare Amazing online storage for FREE! popular is that with it you don’t need to worry will the recipient of your file be able to view it! Jumpshare provides recipient with dead simple way to view contents of your files, eliminating their frustration that was present before when they received file and they did not have way to open it. Built from the day 1 to be as easy as possible to be used, UI of Jumpshare is simple, elegant and it skips some unnecessary steps that you may encounter with its competition. 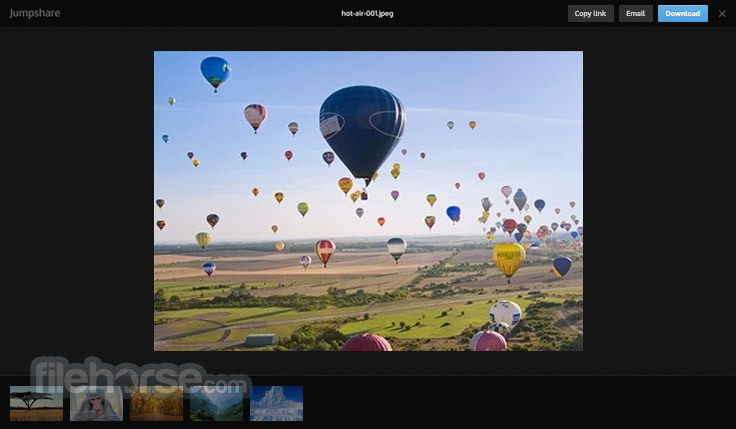 As soon as you land on Jumpshare.com you will be welcomed with the white website with elegant blue theme that informs you to drag & drop file into it. When you do so, you will receive info about the state of the upload, but also, you will get short URL that you can immediately share on social networks, email or your favorite chat services. This eliminates waiting, and enables you to continue with your other tasks while Jumpshare continues to work in background browser tab. Files that you upload are saved only for 2 weeks. Jumpshare’s registration process is fast and hassle free. To create new account you need only to provide valid email address, name and password. Site is also 100% free! Managing to eliminate hassle for both you and the recipients of your files, Jumpshare manages to rise above the competition of other popular sharing services. If you are a type of a person that works often with various file formats, or you know someone that often send you files for which you don’t have the means of open them easily, Jumpshare is a perfect service for you. Everything from uploading, sharing and organizing files to previewing & searching them is just a click away. Folders are automatically renamed based on the number and types of files uploaded. Preview photos, videos, documents, presentations, spreadsheets, books, audios, fonts, codes & much more. While your files are uploading, you can share them instantly with a link or email, in real-time. No waiting! Amazing online storage for FREE! Every pixel is beautifully crafted to make it a great file sharing experience for the users. All files are encrypted with AES-256 standard and it ensure no one can gain unauthorized access.